Once the sun came out, it was a beautiful day – a bit windy, but beautiful. 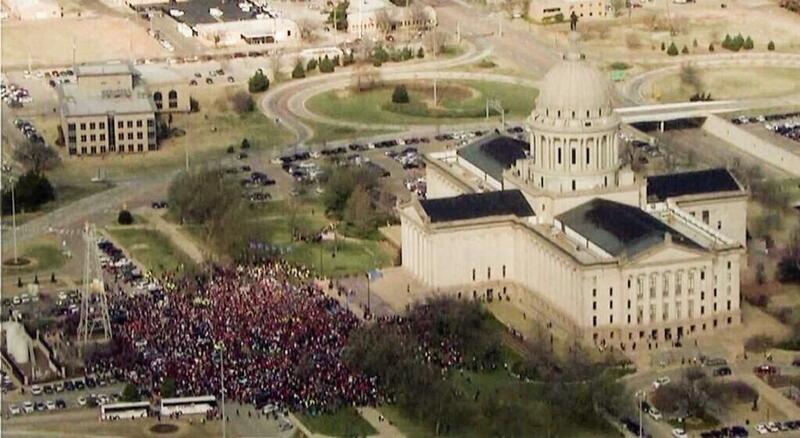 The Tulsa World estimates that nearly 25,000 were in attendance for today’s education rally at the Capitol. Because of the crowd and the wind, I can only say I heard most of what today’s speakers said. For my money, three absolutely nailed it. First was Peter Markes – Oklahoma’s reigning Teacher of the Year. He drew great parallels between farming and education, weaving both the funding issues and senseless mandates into his metaphor. This is the second time I’ve been fortunate enough to hear him speak, and he does not disappoint. He’s exactly what Oklahoma’s teachers expect in an ambassador – someone who believes in the profession and who fights the lie that public education is failing our children. 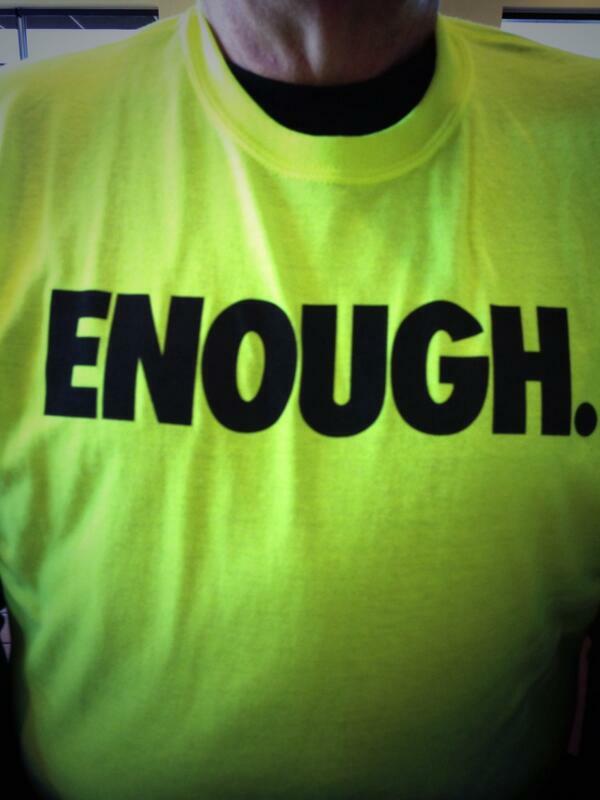 The one who really lifted the energy of the crowd was Tulsa Superintendent Keith Ballard. He hit the funding points, but he concentrated on a more important theme: respect. Every reform that has passed during the last few years shows that those making policy don’t respect the work that those of us who work with kids do. So many talking points from the governor, state superintendent, and countless legislators have come with a Let them eat cake attitude. The lack of concern for teachers, their working conditions, and most importantly, their students has been consistent. Disparage people long enough and they’ll let you hear about it. 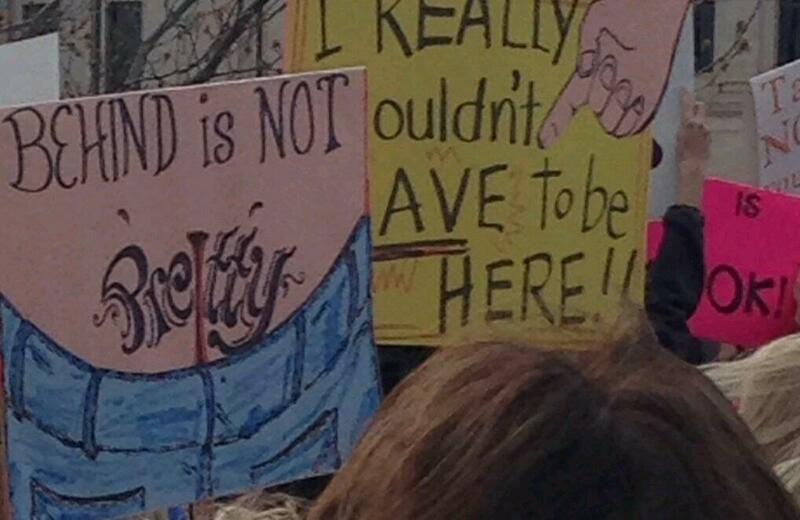 Here are a few pictures that readers sent me from the rally today. Great view of the estimated 25,000 in attendance! How much is enough? Just ask Oklahoma teachers and parents. We’ve definitely had it! I actually selected this one for the yellow sign in back. The sentiment is perfect. None of us wanted to be at the rally. 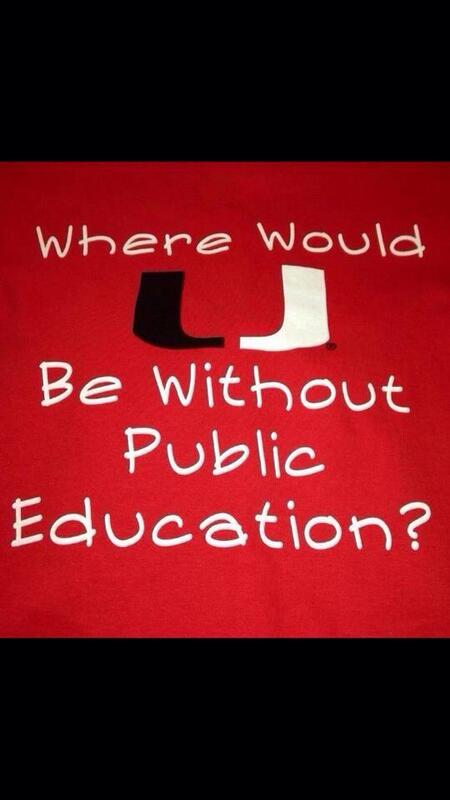 We’d prefer the legislature fund and respect public education without us having to show up. The back of the shirt showed the decline in state aid each of the last five years. 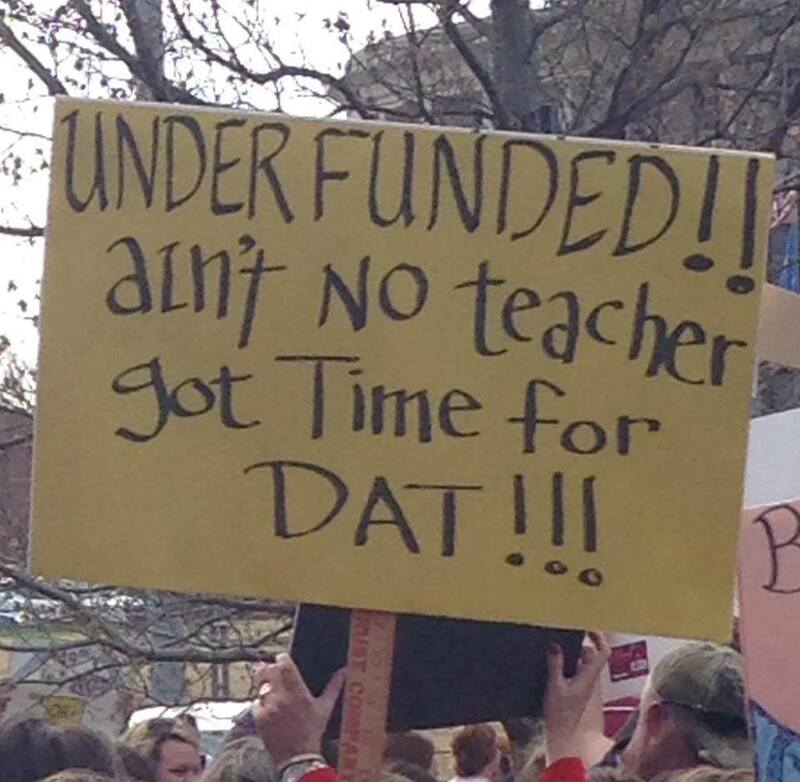 As you probably know, today is the day that thousands of Oklahoma parents and educators will head to the State Capitol to rally for funding for public education. Many in attendance will also enter the Capitol to meet with their Representatives and Senators, discussing issues that range from funding to the relative merits of various school reforms. Yes, we will talk about more than money. We will also cover the Common Core (with many in both camps), the Reading Sufficiency Act (with most favoring HB 2625, giving parents and teachers real input about the retention decision; high-stakes testing in general; A-F Report Cards; Teacher and Leader Evaluation (particularly the quantitative piece). As you also probably know, the Oklahoman absolutely hates this. Don’t be fooled by Monday’s weather forecast in Oklahoma City — partly cloudy with the temperature about 80. For many of the state’s public school districts, this is a snow day. Yes, administrators and teachers will abandon their posts in order to converge in Oklahoma City, to tell lawmakers that common education funding is inadequate. Students, having already lost several days due to real snowstorms, will get another day off for no good reason. Not one member of the Legislature is unaware of how public schools feel about education funding. Lawmakers understand that school budgets have been cut in recent years. But they also know the check written to common ed is always larger than any other government entity. And they’re aware that no superintendent believes his or her district gets enough financial help from the state — ever. That last line is probably true, but the tone of the editorial is entirely too flippant for me. That’s my thing! Nobody is abandoning anything. As I’ve said before, no school district in the state is denying students of the 1080 hours of instruction mandated by state law. For the schools sending people but holding classes anyway, their staffs are taking leave (personal or professional). None of the transportation is being funded by taxpayers. While we’re all aware that the legislators know of our frustration in public education, their actions during the last two legislative sessions don’t show much concern. Case in point is the editorial by Rep. Jason Murphey that ran in the Oklahoman yesterday. Who pays this money? According to the National Education Association’s Rankings and Estimates report, each Oklahoman pays $1,596 per year in state and local funding for education. Provided a taxpayer lives to Oklahoma’s life expectancy of 72, he or his family will pay approximately $114,912 to state and local governments for his education. In addition to the many other forms of taxation, he will pay part of this fee through Oklahoma sales tax, which is the fifth-highest in the nation. The observant will note that this amount exceeds the tuition at some of the area’s most popular private education institutions. Should it really be more expensive for a student to attend public schools than to attend the privatized counterparts? There’s some tortured logic for you – extrapolating a lifetime of contributions for public education into an argument for private schools? Wait, I may be missing the point. It’s entirely possible. I often miss things that aren’t there at all. At least the Tulsa World (as usual) is providing a different perspective, reminding their readers that in 1990, Oklahomans rallied to support HB 10 17, which was a landmark education reform measure. As Oklahoma teachers, parents and supporters prepare to rally at the Oklahoma state Capitol in support of education funding, it is appropriate to look back at a similar effort nearly a quarter-century ago. “Today truly is a day of excellence in Oklahoma. Today Oklahoma stands tall. A new day is dawning for education in Oklahoma. These words were spoken by Oklahoma Gov. Henry Bellmon on April 19, 1990, after the state Senate approved the emergency clause of the landmark $230 million education funding and reform legislation, House Bill 1017. Think about that. In 1990, educators had to lobby a legislature controlled by Democrats to get more funding. Their efforts were lauded by a visionary Republican governor. 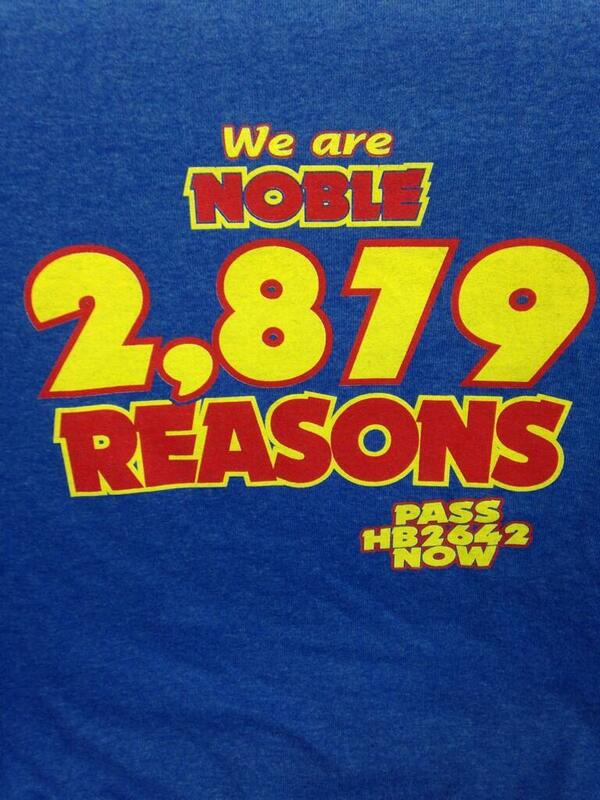 Of course, HB 1017 did more than pump money into schools and fund teacher raises. It also set the groundwork for Oklahoma’s first state standards, reduced class sizes, and implementing early childhood programs. Recent legislative sessions have seen plenty of reforms, but always without the money to support them. That is the difference. That is why most of the legislators I’ve seen comment on the rally – from both political parties – have extended a welcoming hand. They want to fix what’s broken. They want to hear from us. Rally hard. Fight the drizzle and wind. When you’re inside, use your inside voice. When you’re outside, use your outside voice. If you’re interviewed, calmly tell the world what is important to you and why you care so much. Tomorrow, read whatever drivel the Oklahoman editorial page prints and laugh. They know that parents and educators, speaking in unison are hard to ignore. That’s why they will say anything to discredit our efforts. In the words of Miracle Max, Have fun stormin’ the castle! I know what I said yesterday. I need a break from blogging. I really do. Unfortunately, taking that break is predicated upon Janet Barresi not sending us ridiculous emails like the one I read last night. OKLAHOMA CITY (March 28, 2014) — State Superintendent of Public Instruction Janet Barresi made the following remarks concerning House Bill 2625. Slated for a vote Monday in the state Senate Education Committee, the measure would repeal automatic retention of students who score Unsatisfactory on the third-grade reading test and who don’t meet a good-cause exemption. “To deny children the opportunity to learn how how [sic] to read is to deny them an opportunity for success. Reading is the most fundamental aspect of an education. It is unconscionable that anyone would think it’s too much to ask that a school teach a child to read. “Extensive research shows that moving children forward in school without the ability to read proficiently sets them on a course of falling further and further behind. It condemns them to frustration and failure. But there are also severe consequences for the students who are able to read proficiently, as fourth- and fifth-grade teachers must increasingly spend their time in remediation with the struggling readers. “The Reading Sufficiency Act has been in existence for 17 years to identify and provide intensive remediation for struggling readers as early as kindergarten. And yet after 17 years and more than $80 million in funding, the percentage of Oklahoma students reading below grade level has remained flat. We cannot allow this to continue. We cannot continue sabotaging the promise of future generations. “I urge Senate Education Committee members to continue to support high standards by ensuring that our children can read. I would ask that they let the RSA work. There already are good-cause exemptions to address an array of special circumstances. Predictions of catastrophe are simply incorrect. When the State of Oklahoma mandated end-of-instruction exams as a condition for high school graduation, critics made similar predictions that the sky would fall. Instead, Oklahoma’s young people rose to the occasion, with the passage rate at 99 percent. She has every right to have an opinion and to use her position to try to influence the outcome of a vote. I take issue with the language she uses. Nobody is trying to “deny children the opportunity to learn how how to read.” (Aren’t you glad we’re not debating the Writing Sufficiency Act?) Reasonable people – and by reasonable, I mean the parents and teachers who work with children every day – believe that mandatory retention does more harm than good. I also take issue with her selective use of research in paragraph three. This from the mouth of a politician who derides researchers when it suits her! Everything Barresi says reeks of a selective view of her particular agenda. Research also shows the damaging effects of retention. She never talks about that. She mentions the Good Cause Exemptions but fails to mention that they are quite limited in their coverage. She also fails to mention that Florida pumped millions of dollars into useful programs when they went down this road ten years ago. Barresi also talks of empowering parents, when it is convenient for her. What’s more powerful than having parents and teachers sit down at a table, discussing student achievement, and making educational decisions together? That’s what HB 2625 would allow. I’ve recently heard Barresi say that the RSA existed for 17 years before the retention clause was added, and now the Act has “teeth.” Lots of things have teeth. That’s something Barresi can discuss with authority. Ok, now I’m on hiatus. I woke up this morning and realized that I haven’t posted anything for 10 days or checked my Facebook or Twitter accounts for a week. I’ve been focusing on other things, and I probably will be for a few more weeks. I’ve decided to take a little break. That doesn’t mean I won’t be at the Rally Monday, however. I’ll be there in my professional clothes, speaking in my professional voice. The members of the legislature with whom I speak will hear the following from me. Public education is not failing. Despite the pervasive rhetoric to the contrary, public schools are good at doing the job policy makers have asked us to do. Policy makers should probably listen to what teachers and parents say more than they listen to ALEC, Jeb Bush, and Michelle Rhee. As we sit on the precipice of overturning the Common Core (and probably replacing it with something very Common Core like), legislators, the governor, and our next state superintendent should remember who votes for them rather than who funds their junkets. Funding for public education is critically low. Oklahoma schools have more students than we did five years ago. We also have fewer teachers. And in spite of what Superintendent Barresi claims, we aren’t hoarding money in mason jars in the yard. The legislature has more money to allocate right now than at any other point in Oklahoma history. As Governor Fallin loves to point out, the average income in this state is rising relative to the rate of inflation at a higher rate than any other state except for North Dakota. It is unconscionable to think that public education could still receive a smaller share of the pie than it did five years ago. The RSA law is highly flawed. The safety nets in place for special education students and English language learners are wafer thin. Parents – in spite of districts’ efforts to keep them informed – are panicking. Parents are driving the momentum to opt out of testing, not school districts. They are tired of the wasted time. They are tired of the meaningless results. Yes, some of the testing is federally mandated. However, the state adds to that burden. After last year’s debacle, this problem is on their radar more than ever. The SDE continues placing people in positions that are above their level of experience. This has not gone well. To be honest, we the electorate are partially to blame. We picked the state superintendent. If you’re thinking that this hiatus is the result of my lousy NCAA bracket, I assure you it’s not. I’ll be back in a few weeks. In the meantime, remember that there are other bloggers in the world. I get confused sometimes with my social media days. Is it Man-Crush Wednesday and Follow Thursdays? And what’s the one with the talking camel? I guess that’s not really terribly important. Today, I want to show you a quote from a couple of years ago and see if you can guess who said it and about whom. Bonus points if you can figure out from whose website I lifted it. To make you think for a few seconds, I’m going to insert a series of tweets that have nothing to do with the quote or one another (or do they?). Ok, time. Do you have it? First, I should mention that those four tweets really are unrelated, other than being a few of my favorites during the last month or so. Barresi’s campaign manager, Sam Stone, made the Open Records request by letter on Jan. 28 and asked that they be available for inspection by Feb. 10 or Feb. 17. “It’s part of doing our research on Joy. We’re trying to flesh out her positions on the issues,” he said. 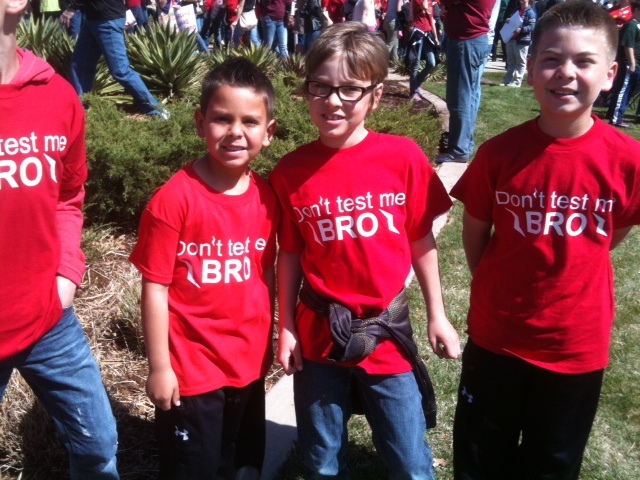 All four of Hofmeister’s children have attended Jenks Public Schools since kindergarten. Only one child, a son, remains in Jenks Public Schools. He is a senior. She also has been a member of the board of the Jenks Public Schools Foundation. [Jenks CIO Bonnie] Rogers has worked since receiving the request compiling thousands of emails and correspondence between Hofmeister and any Jenks school employee and she has still only made it to 2011. The district’s email archive only goes back to October 2009. So far, she has pulled up 3,661 emails and used four reams of paper to copy them. My hunch is they don’t know what they’re looking for either. This seems like a needle-in-a-haystack exercise to me. Then again, it’s all perfectly legal. Barresi’s campaign is making the request this time, unlike last year when her agency went after Rob Miller. That was perfectly legal too (incredibly misguided, but legal). In fact, any person can initiate an open records request against any government entity. Sure, it can become burdensome, but hey, they work for the public. They’re here to serve. Hmm. Let me say that again. Anybody can make an open records request at any time. Say, for example, someone was curious about any correspondence between the Governor (or her staff) and Barresi (or the SDE) about how to protect the Common Core…such would be a reasonable inquiry. Or if you were curious about internal discussions of how the SDE should react to CTB’s complete meltdown last year during testing…that would be ok too. Even if you wanted to see how the Barresi’s inner circle discussed the relative merits of various A-F Report Card formulas with key legislators…they’d have to provide that information too. The possibilities are endless! You see, part of serving the public is an ongoing commitment to transparency. It’s not bullying or intimidation to ask for answers – until someone does it to you. Imagine you and your wife have a passion for public education. You’re having lunch together when you see the person responsible for doing so much damage to it. 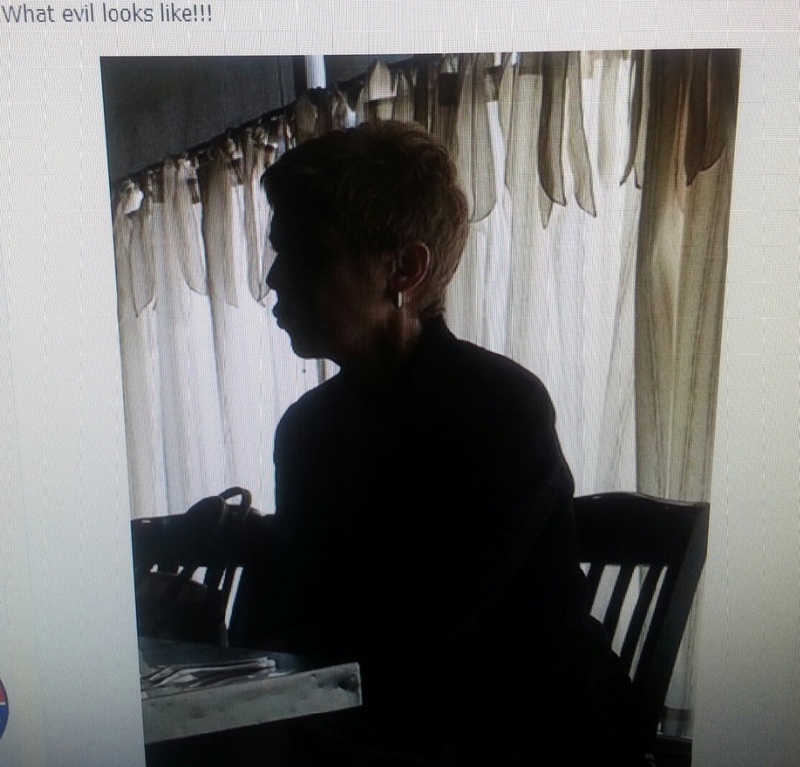 Naturally, you’d take a cell phone pic and provide running commentary to Facebook. Then you’d make sure screenshots were sent to your friendly education blogger. I hope the meal was good – not that this is Urban Spoon or anything, but I’ve always had good meals and service at Iron Starr. Superintendent Barresi’s words continue to show that she doesn’t have much regard for us professionally or intellectually. Ours show that we’re not going to take her disrespect without a fight. 20 years and no accomplishments, right? Remind me…did we have content standards (PASS) before Sandy Garrett? Did we have Nationally Board Certified teachers? Superintendent Garrett was in office for a long time and surely had her flaws – all politicians do. Denying her ability to work with a legislature of her own party, then a split one, then one of the other party just flies in the face of reality, though. I edited some of the screen shots to take out comments by the people who didn’t consent to me using their contributions to the conversation. If I had left more of this in here, though, you would see that he says Lake did not contribute to the teacher bashing. Ah, the liberals again. 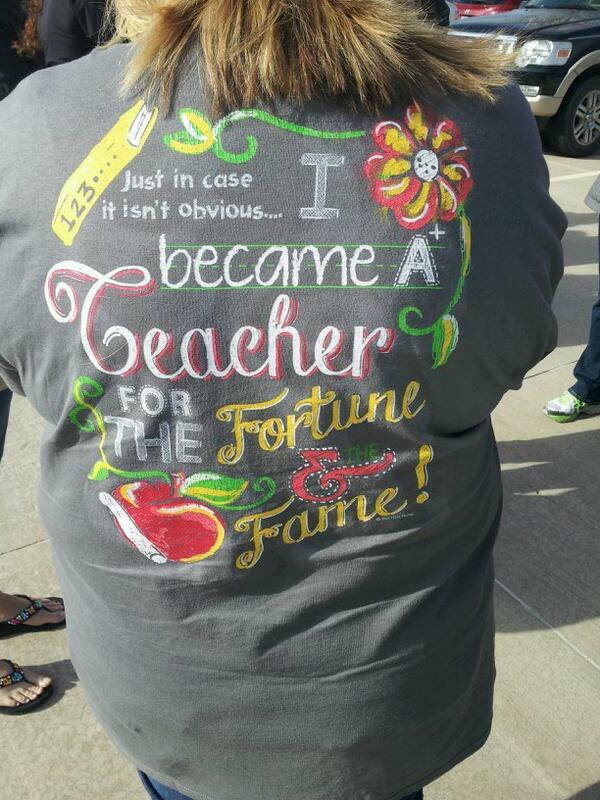 Do we really want to root out teachers by political affiliation? There’s a roller coaster I don’t want to ride. Another favorite target – one of those pesky Tulsa-area schools.